After a quick breakfast again at Silog Republic, we started our Tour C adventure. We were now joined by Honey's cousin and funny girl, Doll, and her friend, Garnet. The morning was not so bad, still gloomy and all; this time, we were accompanied by another big group of Pinoy travelers. Our boatman cut off the boat's engine about 45 minutes after we left Buena Suerte's shore. We were informed that our first stop for the day was the Hidden Beach. It's called the Hidden Beach because well... it's hidden. You can't see it upfront. 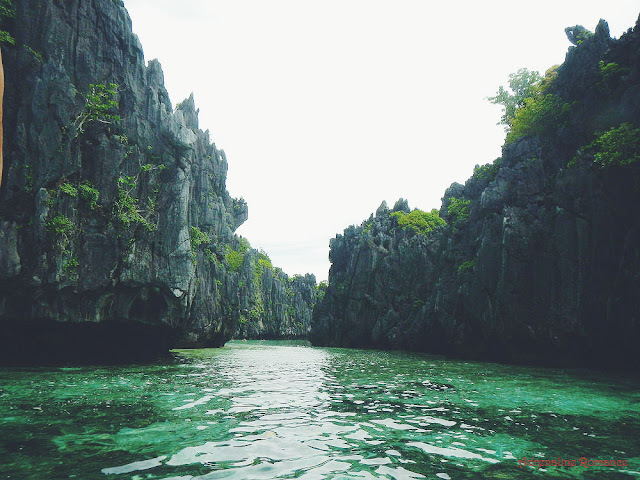 The first thing we saw when we were approaching the area were these extremely high and jagged limestone walls and I was fearful for a moment that we would need to climb or dive (gasp) since we cannot see any shore or sand. Then... lo and behold. Mother Nature certainly knows how to take my breath away. Hahaha. 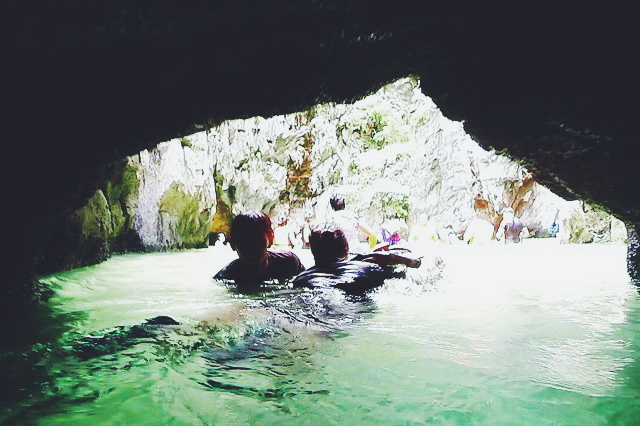 And since it had a narrow opening, we had to swim through the channel of water between these 2 limestone walls. Good thing for non-swimmers like me, it's not that deep. 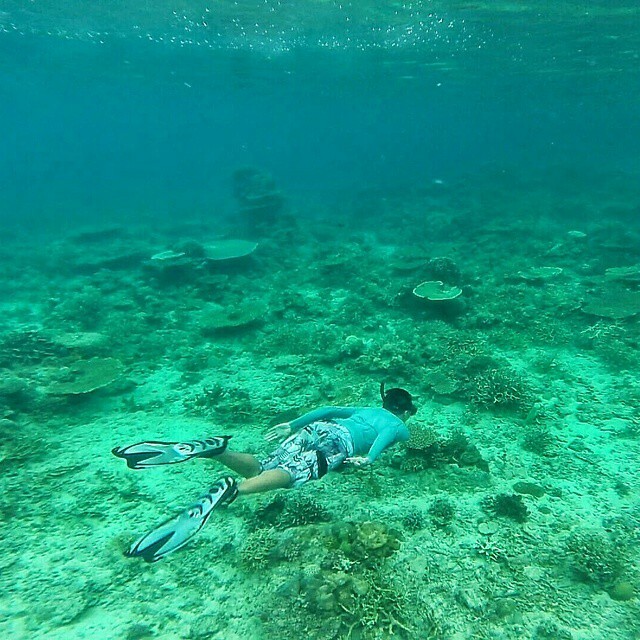 The water's so clear, you wouldn't need to go underwater to see the corals, but where's the fun in that? The sand was fine and white. 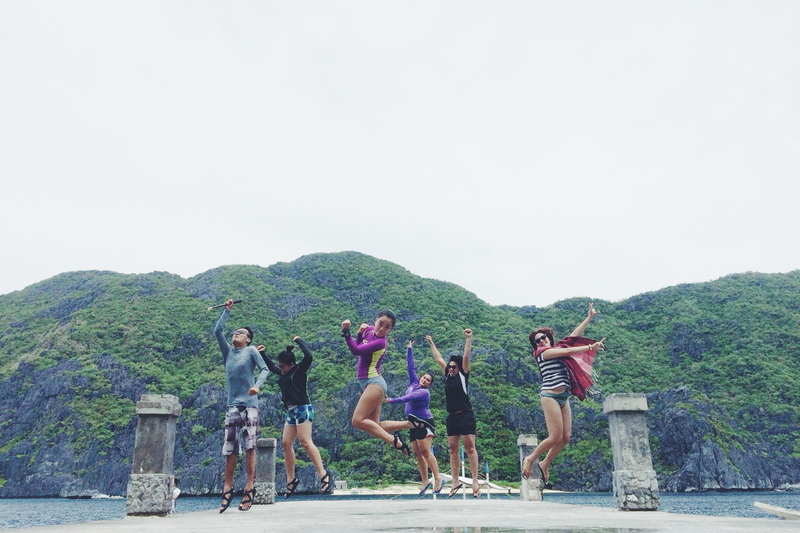 We got the most awesome travel guide, Kuya Elfer, who suggested poses and shots to us. He's super funny too! 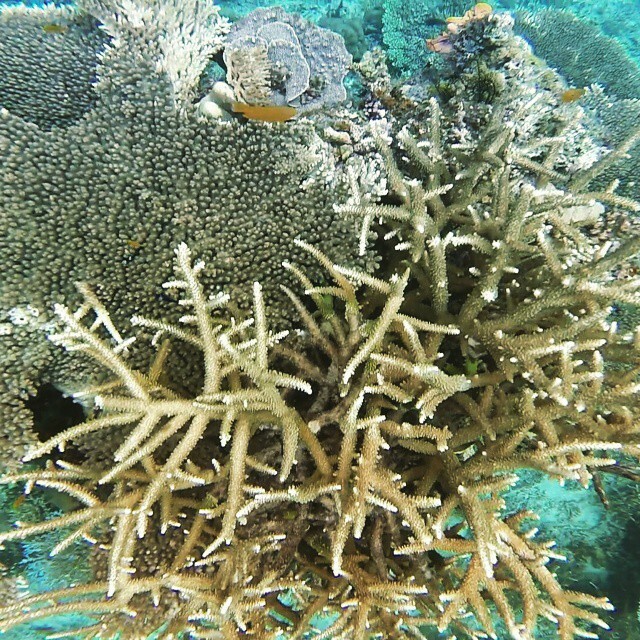 A little clown fish is hiding somewhere in that coral. 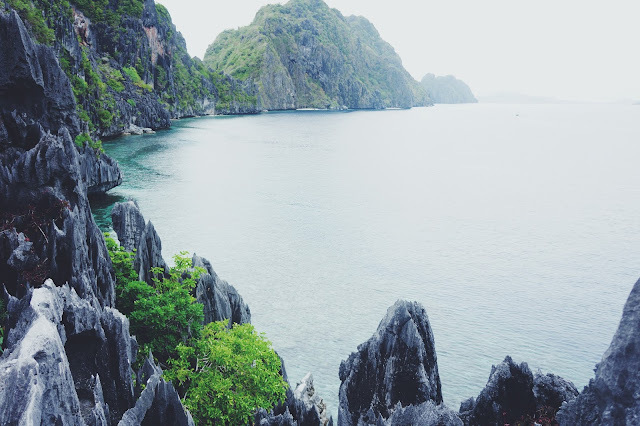 Kuya Elfer also told us that the Hidden Beach was one of the sites for last year's Expeditie Robinson, the Netherlands' version of Survivor. How cool is that. I've now been to 2 Survivor locations! 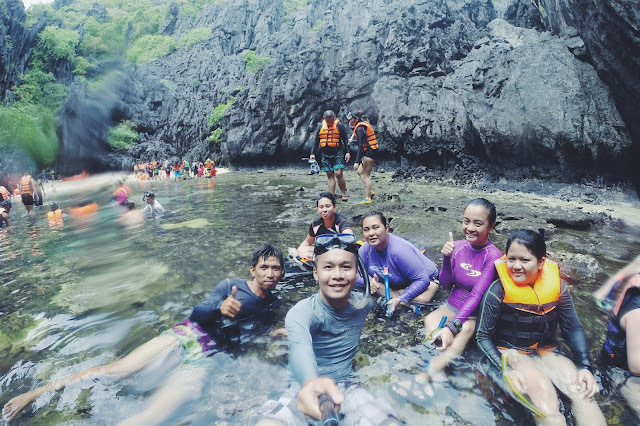 First is in Palaui and now, here in El Nido! I would've preferred to stay here longer, but after an hour of frolicking and floating and countless GoPro pictures and videos, we headed back to our boat for our next destination. But instead of taking the same way back to our boat, we exited the beach by passing through this little hole in one of the cliffs. We made a very quick stop at this deserted sanctuary because the place was swarming with mosquitoes. I guess it was due to the intermittent rains the past few days. I really don't know the real story of this shrine. We were told this used to be a seminary that was later abandoned. If you Google this place, there's different versions about its history. I can't tell which one is true. 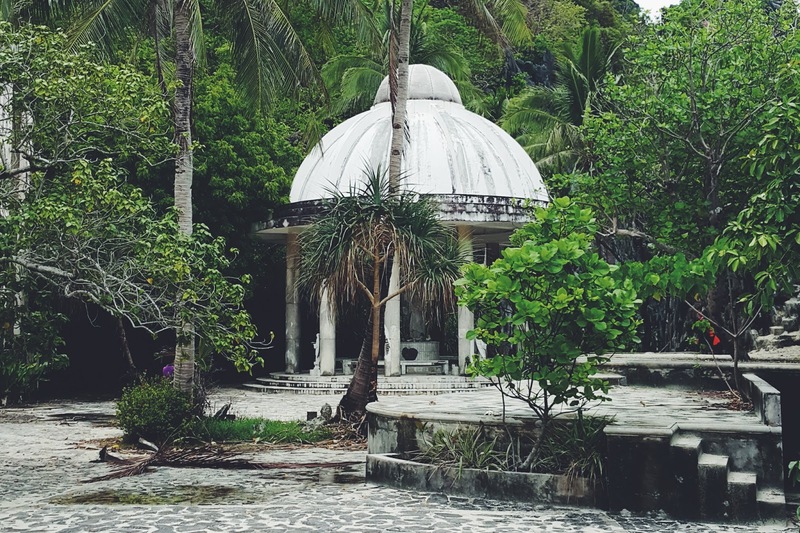 A mansion's erected here together with a gazebo that houses a statue of Our Lady of Matinloc. What went wrong here? I guess we'll never really know. The gazebo which houses the shrine. Again, creepy. Our guide told us the best part about visiting Matinloc Shrine is to see the view after climbing the limestone wall on the far right. I hate climbing because I am such a klutz, and in not in an endearing, cute way. I don't know. Make me swim and snorkel (naks!) but please don't make me climb. But no matter how many times I keep on saying that, I still end up doing it. YOLO daw eh. Haha. We were told that the rocks we're climbing could collapse anytime. (Thanks, kuya. That was comforting.) There were no hand rails going up and the rocks are really steep and sharp. So you need to be very, very careful. After seeing this breath-taking view, I was the first one to go back down. I can't stand to spend another minute on an unstable rock formation with at least 14 people on it. Hahaha. Next activity: lunch! After swimming and a little bit of climbing, we docked at this little piece of land to eat. I figured it was named Talisay Beach because there was a big, prominent Talisay tree in the island. There were already a few boats anchored by the island, each group of people settling on different spots so they could have a place to eat. 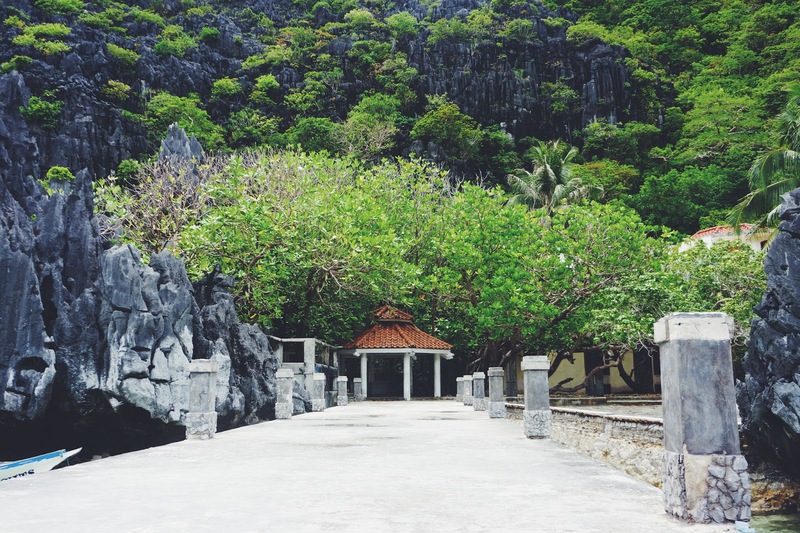 We put our things down next to the limestone wall on the rightmost part and had music to accompany the beach vibe. 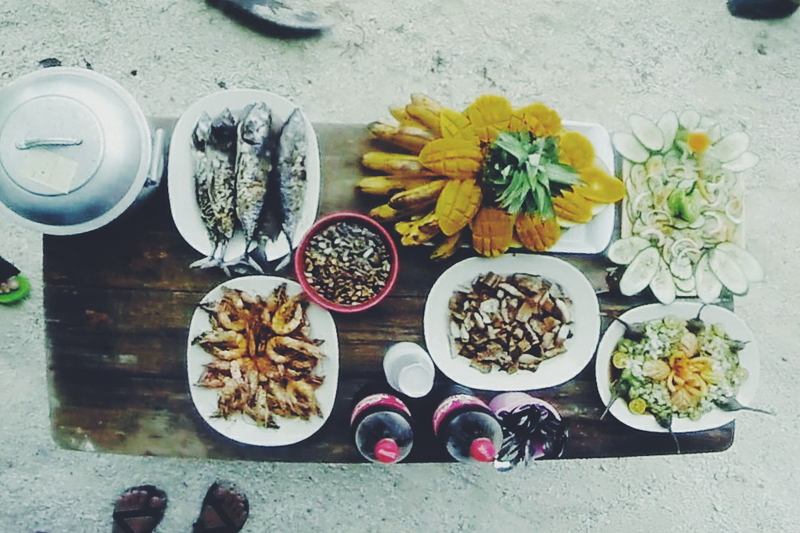 And since our boatmen (slash cooks) still needed time to prepare our lunch, we decided to snorkel a bit. There were so many different species of fish! (Sorry, these are the only photos I have.) 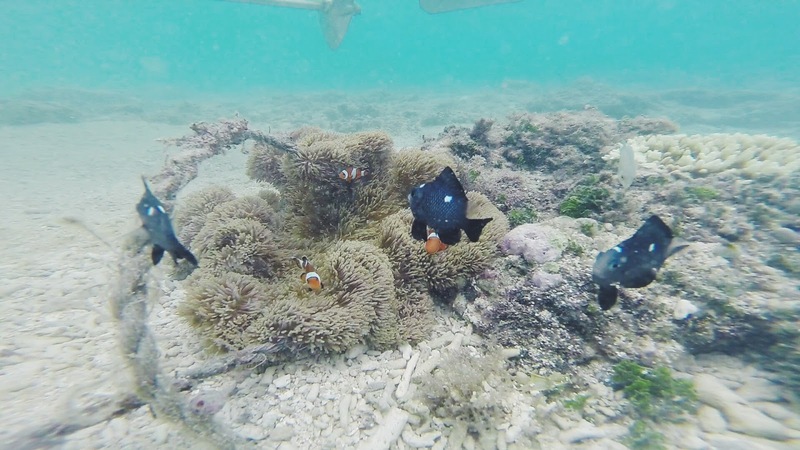 Even in the shallow parts, there were schools of fish everywhere. We spent around a good 10 minutes just hovering this sea anemone. It's therapeutic even just by staring at it. 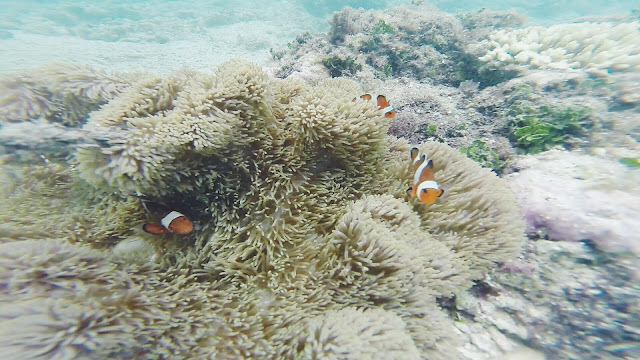 Clown fishes are just the cutest, no? We had grilled fish, liempo and shrimp, ensaladang talong (eggplant) and a mishmash of vegetables for lunch, and sweet, ripe mangoes and bananas for dessert. We were 14 people in the boat, so yes, this was pretty much gone after a few minutes. LOL. I would have taken great pleasure in eating some of those sweet, succulent mangoes but there weren't any left when I made a trip back to the table. Good thing Ian's a great friend and offered half of his mango cheek to me. But nevertheless, it was sumptuous and satisfying! After a couple of minutes of just laying down to digest and rest, we boarded our boat once again to proceed to our next stop. 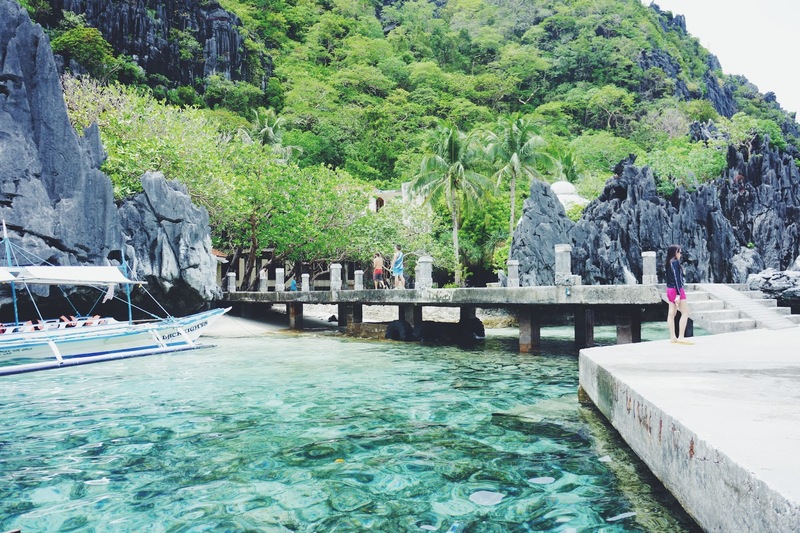 El Nido is full of surprises and mysteries in the form of islands and beaches. Here we have another hidden gem, aptly named Secret Beach. Just like the Hidden Beach, you wouldn't think there's an actual beach there because as usual, all you can see are endless walls of rock. And this time, there's no other way but to swim through a door-sized hole. Great. I made it in! Thank you, Kuya Elfer! 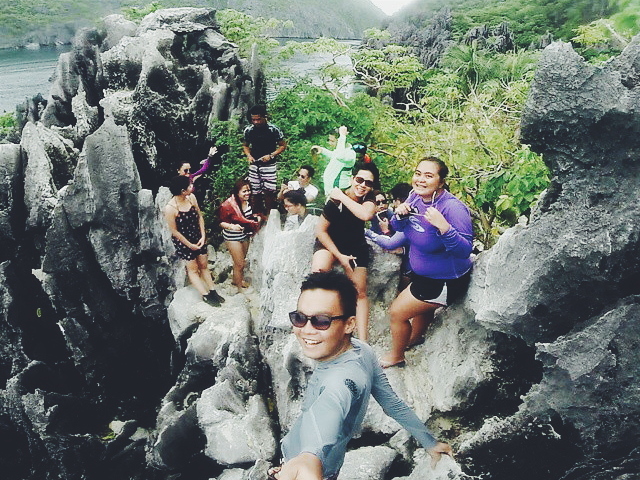 Best tour guide ever, Kuya Elfer, and us just chilling by the brown rocks. LOL. 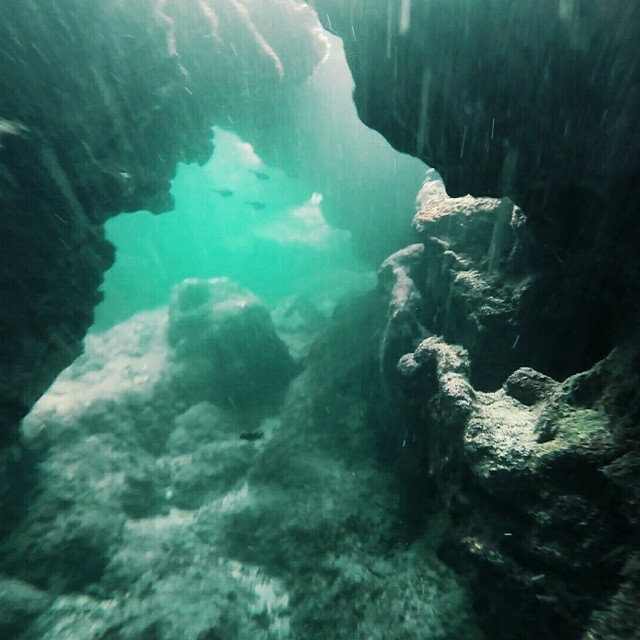 As soon as you reach the opening, the water immediately turns shallow and you're met with rocks and the uneven sea floor. It was such a struggle for me to get steady foothold and I had to constantly make my way through brown rocks with holes in it to make sure my foot doesn't get stuck with every step. 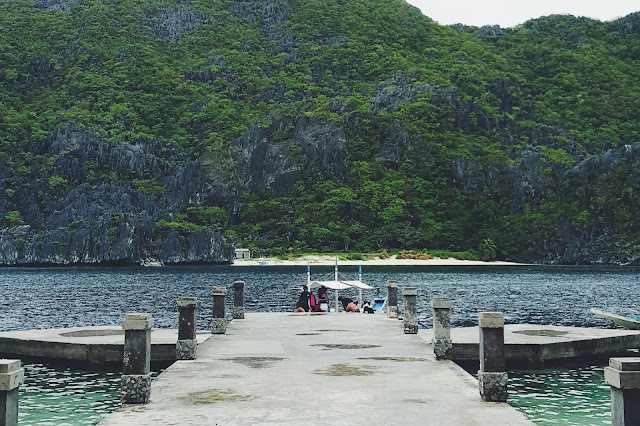 Secret Beach, according to some blogs, is the inspiration behind Alex Garland's best-selling novel-turned-movie, The Beach. 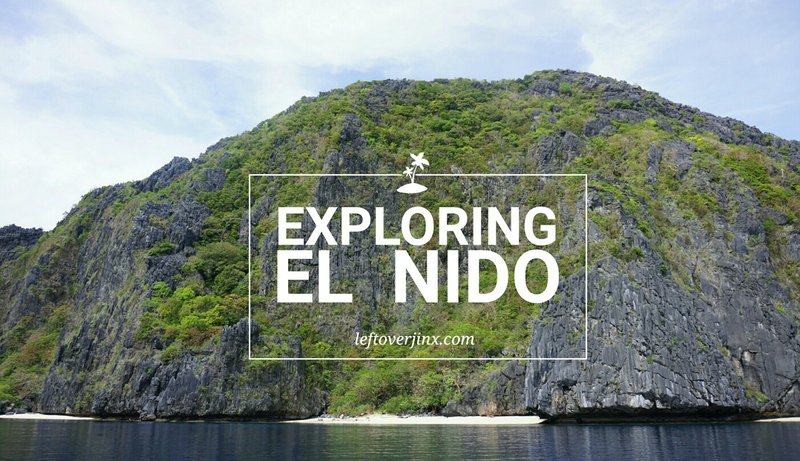 I tried researching for proof but I just end up with articles saying just "El Nido" but not specifically this beach. The place was getting crowded by the minute so we didn't get to enjoy this spot very much. We just sat on one corner (I swear a fish kept nibbling on my leg! Haha!) and watched people go by. A "Pure Shores" state of mind was not possible with the crowd getting bigger and bigger. Amazing, right? Amazing and scary. Haha. This is why I'm afraid of the ocean. It's just an endless abyss. This was our last stop for Day 2. People from El Nido really have some straightforward names for their beaches and islands. Hehe. Yep, the island is named as such because it resembles a helicopter. Or the lengthwise half of a chicken leg. 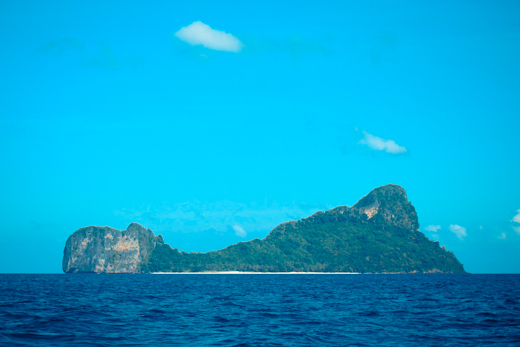 It would be so cute if an island is named as Chicken Leg Island. Hahaha. A little surprise: there are ice cream vendors here! So chilling by the shore with a cold dessert in hand is definitely an option here. About a few meters from the shore is a great diving and snorkeling site. Different varieties of fish and other marine life, and virgin colorful corals await the island's visitors. Kuya Elfer swam towards the spot with us in tow, of course. Haha. This was just too deep for my temporary courage. 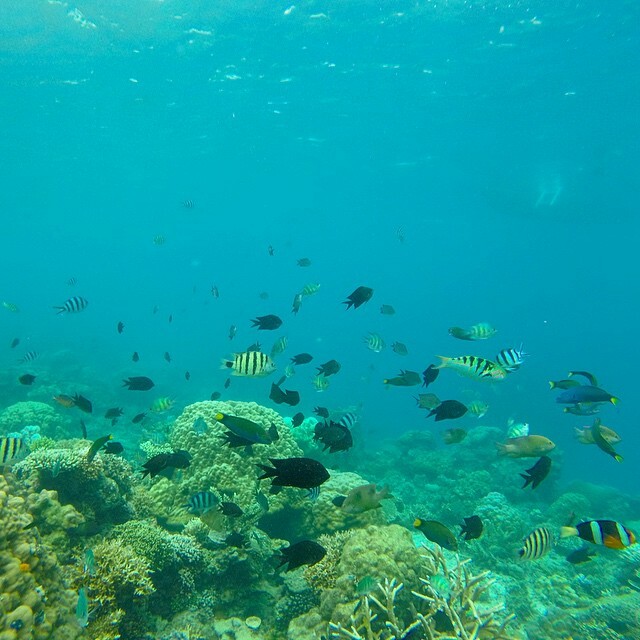 It was just spectacularly beautiful under the sea. It's a whole new world there! Ian and Honey having fun! That's Kuya Elfer, right behind Honey, and me! Haha! I really think Ian was a turtle in his past life. NOT OUR PHOTO! From Mary C's Instagram account. 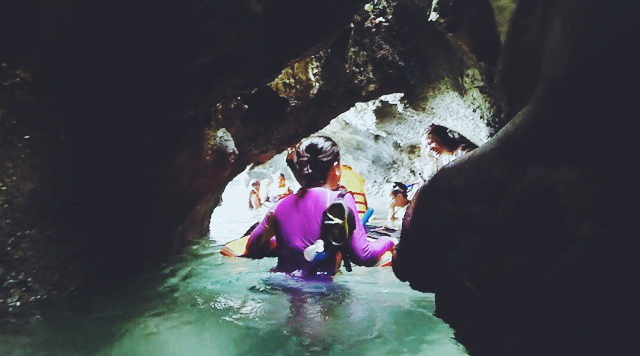 Borrowing this photo because we don't have enough and this is basically the same thing we saw under the sea. Heh. 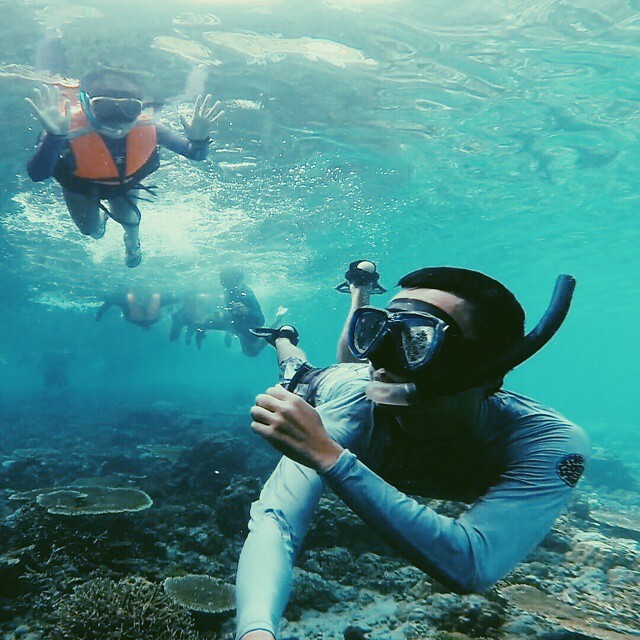 Yep, this is what's in store for you when you snorkel in Helicopter Island. Stunning, right? And if you're lucky enough, you might just get to swim with turtles! 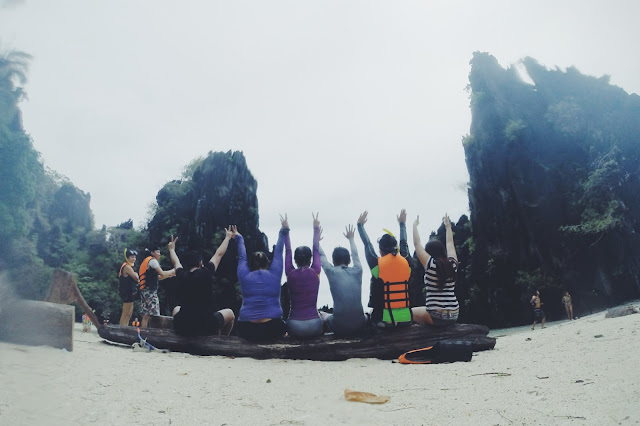 What a great way to close our second bout of island hopping adventures! 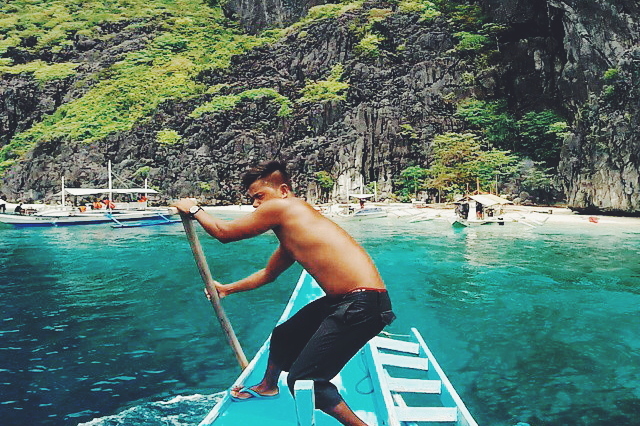 I think this was the time I fell in love with El Nido. The Hidden Beach really did it for me. I was tired from all the swimming we did but it was hella fun! I hope you found this post informative and enjoyed the photos as much as I did! Tours were provided by Northern Hope Tours. Ask for Kuya Elfer as your tour guide! He's the best! 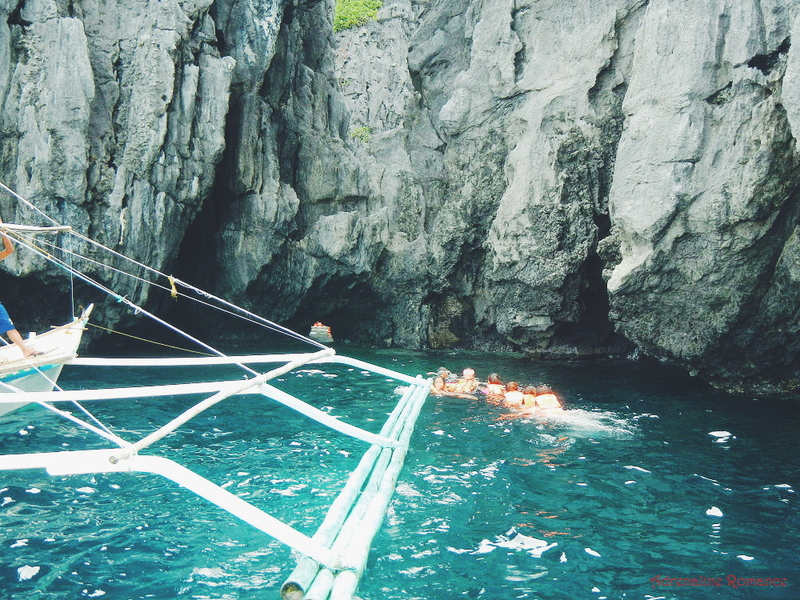 Tour C costs PhP 1,400/person. Snorkeling gear and fins were provided as well as lunch. Please bring cash. I don't recall seeing any ATMs there. For emergency situations, there are pawnshops that offer money transfer services. Power interruptions are frequent during day time. It's best to wear aqua shoes/sandals during the tour. Food, overall, is affordable. For our first night, we had dinner at Angel Wish, located right beside El Nido Sands Inn, and we had a set meal for PhP 950 which was good enough for 6 people. There's also a lot of eateries you can find on most streets. We frequented Silog Republic for breakfast and dinner. This looks like paradise. Hope I can go here someday. Your photos look beautiful and thanks for the info about this trip. ANG GANDA PLEASE!!!! 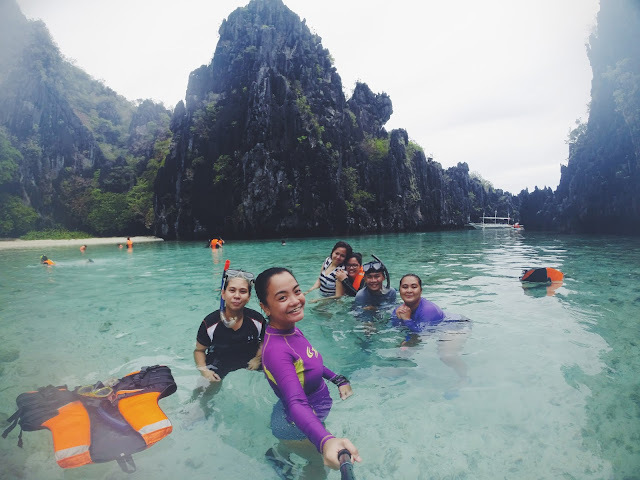 Super gusto ko din mag El Nido, kaso most likely dalawa lang kami, so we have to find a way to make the expenses smaller. :( But we'll see. I want to go hereeeeeeeeee!!! Yung total budget ko dito is 10k (excluded yung air fare, piso seat naman yun!) 5 days na yan. 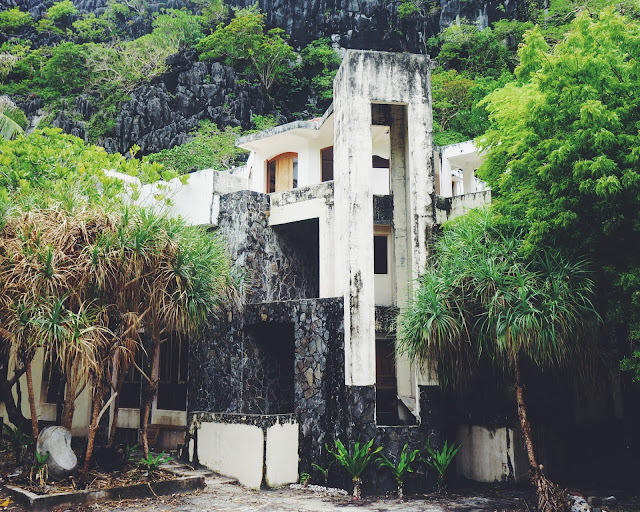 Inclusive nung island hopping package (Tours A, B and C), land transfers, accommodation and food. 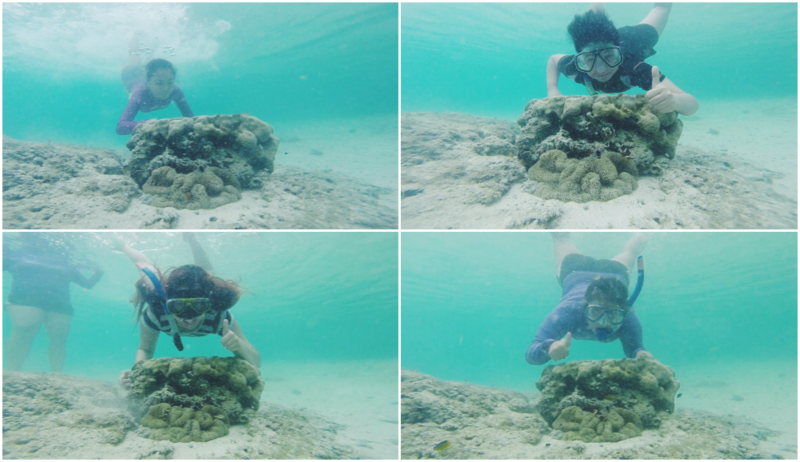 Yung chunk is yung island hopping package talaga. You should definitely visit El Nido! Ang gandaaa! Para na akong nakapunta sa el nido dahil sa photos mo. Your underwater shots, ayoko na! <3 I need this in my life huhu Once I graduate, I'm really going here! If only I know how to swim and dive, Helicopter Island would have been my favorite too, Angel! Haha! The marine life there was just abundant and beautiful. A week later from our trip, I saw posts on Instagram where people were able to see turtles! HUHU I WILL! Hopefully by next year. AHHHHH thanks Trish!! !